Kenneth Womack is a renowned author, music historian, and wild Beatles enthusiast and he puts all of these sundry skills to admirable use in his latest book, the elucidating and engaging biography Sound Pictures. As the second half of this life story about revered Beatles producer George Martin, this installment lures the reader right into the glorious, madly visionary creative process between the stalwart producer and The Fab Four — a collaboration that has yielded some of the world’s finest pop music. As you’d expect, Sound Pictures picks up where part one (Maximum Volume) left off. The Beatles have come off a series of live concerts which sapped their energy, kicked up some irksome scandals, and left them frustrated by crazed crowds who screamed so loudly that they couldn’t hear themselves sing in concert. Martin, who shaped their extraordinary destiny from the beginning, could have viewed this withdrawal from the public sphere as the death knell of his greatest success. Instead, he seized it as an opportunity to bring the lads into the studio full-time, where they could create and craft music under his guidance. The change in paradigm led to a widening of their compositional horizons and a series of brilliant albums that would define their legacy. Through exhaustive research, Womack takes us on a mind-bending tour of what occurred inside these fabled recording sessions: Martin elegantly led The Beatles through the process of taking their already considerable skills and embellishing them through all manner of innovative techniques. Tracks were electronically sped up or slowed down (a process John Lennon cheekily called “flanging”) to brighten or intensify their voices. Martin was also a maestro when it came to utilizing engineers, principally the late Geoff Emerick, who added alternate sounds cooked up in the studio, embellished with lush strings and brass, and wove in chatter and backward-playing tracks. Some of these devices were relatively new at the time for pop music, which made the results oft-times groundbreaking despite the fact that The Beatles didn’t have access to the best, priciest equipment. But Martin’s ability to shape a song sprang largely from his own cleverness and love of experimentation. While Womack keeps the gritty details of Martin’s personal life somewhat modest, we get a sense of his passions both in and outside the studio. We learn of his second, enduring marriage, and the happy family life he escaped to now and again. His devotion to The Beatles was extraordinary, from navigating the “Jesus” scandal which threatened their popularity to grieving the loss of manager Brian Epstein, who overdosed in 1967. While viewed through a fond lens, we get a sense of Paul’s controlling nature, John’s insecurities, George’s resentments, and Ringo’s conviviality (as well as his top-flight drumming skills). As The Beatles began to burn out and grow apart as a band, there was clearly pain and suffering to go around. John’s love for Yoko Ono grew unbearably awkward as she was the first girlfriend to actually hang out in the studio while they worked, initially in a quiet fashion although later, less so. Through it all, the gents continued to make stellar music until their break-up in 1970. George Martin remained active and rightfully lauded for his 40+ post-Beatle years until his death in 2016. While this is understandably not the main thrust of Sound Pictures, his involvement managing legends like Elton John, Jeff Beck, Kenny Rogers, and Cheap Trick — not to mention a solo Paul McCartney — is given ample coverage. The totality of the man and his production gifts are well acknowledged, but clearly, it is in his partnership with The Beatles that Sir George Martin (knighted in 1996) has staked his claim to eternal fame. Click here to order your copy of Ken Womack’s Sound Pictures: The Life of Beatles Producer George Martin, The Later Years, 1966-2016. 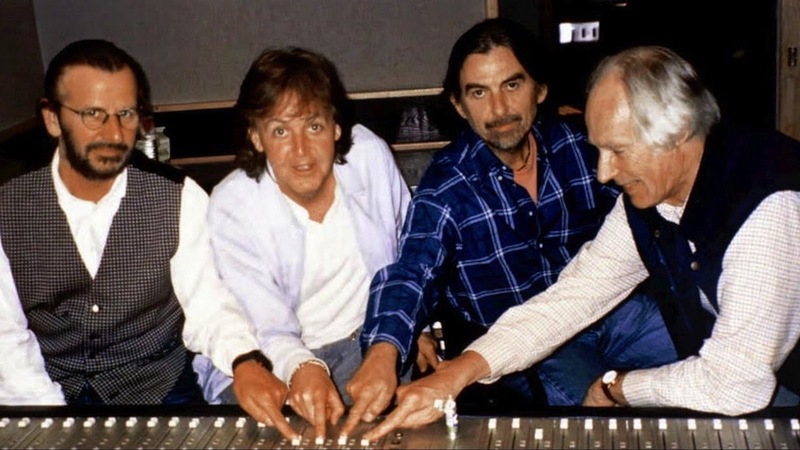 Photo Credit: Image of Ringo Starr, Paul McCartney, George Harrison, and George Martin courtesy of 910 Public Relations, LLC.